Brian was born on May 25,1958 and his roots are in the small outport of Pilleys Island, Newfoundland, Canada. At the age of nineteen he moved to central Canada in the Sarnia, Ontario area, where he now works in the Petrochemical industry. His interest in art began in high school, when an art teacher encouraged him. 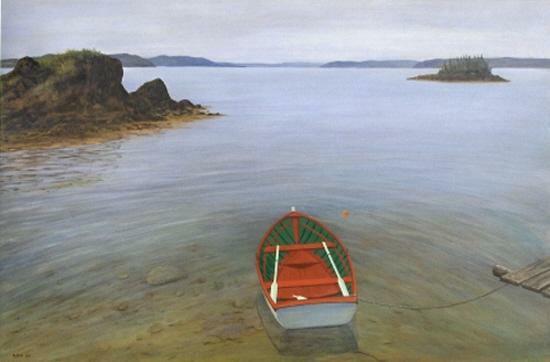 In 1979 he began to paint realistic images of Newfoundland and northern wildlife, using an acrylic medium. He has many admirers of his work and most of the paintings have been sold; many were commissions. In 1998 he did a painting of an old united church (circa 1945) for his hometown heritage society. Prints were made and sold as a fund raiser. In 1997 he entered an art contest in Sarnia. This contest was held to select a winner to commemorate the new blue water bridge. The painting got an honourable mention and it was reproduced as a limited edition print. Brian has no formal training in art. He is self taught and learns most from a careful observation of the order and design of the natural world . He believes that “nature is the artwork of a creator/master artist who displays a wisdom and a genius that we have only begun to understand”. His focus is to create art that will cause the soul to search for a deeper meaning in an increasingly chaotic world. He started striving for a photo realism style in the 1990’s and achieved it to some degree, but, he found the style did not evoke much emotion and set out on a journey to find a style that was realistic but, with a much looser impressionistic approach. 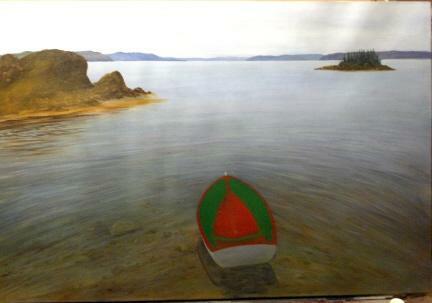 Eighteen of his paintings were on display at his hometown Petrolia Library during the Summer of 2004. 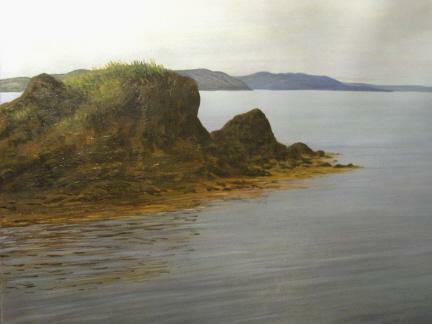 I got the idea for this painting while on vacation in Newfoundland. 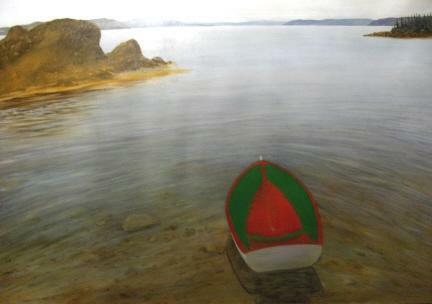 The quiet and serenity of this area was what I wanted to capture in the painting. I liked this reference image below as a photo. But, I wanted to do something else in a painting . 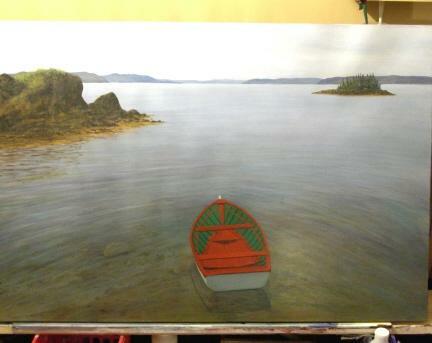 I thought I would push the islands apart so that the boat would point out the bay towards the opening in the distance. It just seemed right for a better composition. 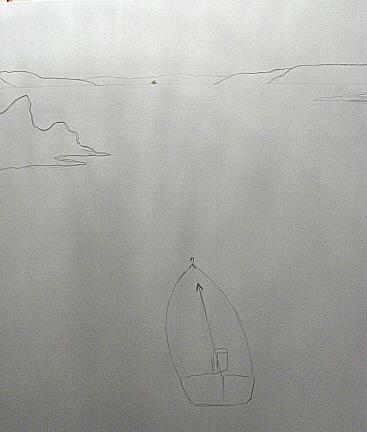 I lined the head of the boat up so that it would point directly at that dot in the background. 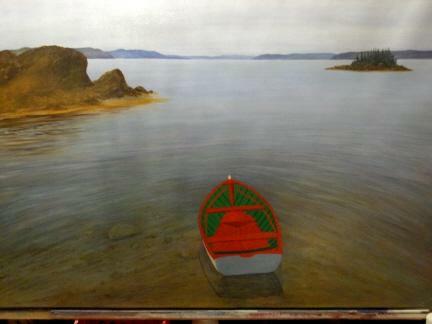 I guessed that this would become the secondary focus in the painting, after the boat, if I had enough elements pushing the eye outward towards to that area. The hint of the dock would provide a link from the boat to land and serve as a directional line toward the boat. I wanted to keep the overcast sky. It seemed to suit the painting. I wanted to show the ocean bottom near the dock . 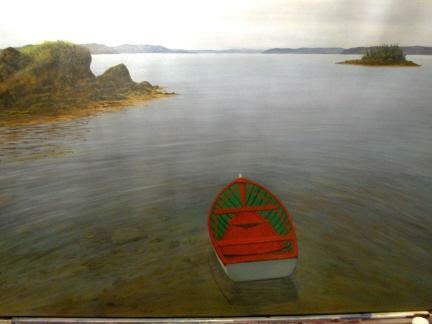 Calm, shallow water would serve as a great enterance to the painting and add to the over all appeal of the view . I had never attempted this transparent water look before. I started by putting in the main colors of the bottom .Then I painted rough forms that looked like rocks . I used Thalo blue , Ultramarine blue, Paynes grey, a tad of Napthol red, and White mostly in the water and sky in the distance. I have a glaze or two of burnt sienna and yellow ochre in there too. In the foreground there are those colors plus burnt sienna, raw sienna, yellow ochre . There may be a little burnt umber in the mix too. 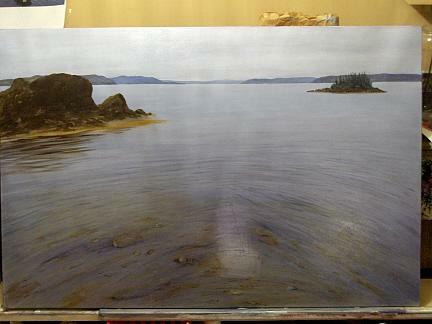 My next move was to paint in the distant hills and island. . 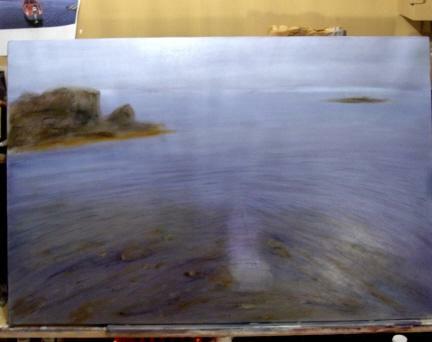 It took a lot of glazes and a few attempts to get the water and sky the way I wanted it. 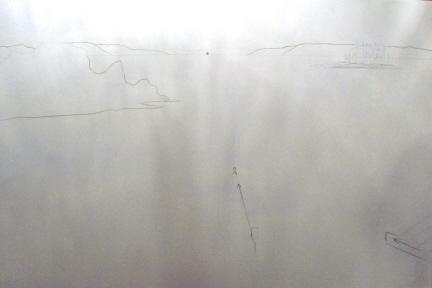 I wanted that opening in the distance to be in the direction that the head of the boat would be pointing towards. The pushing apart of the islands and moving the distant opening to line up with the boat seemed to also open up the view for the eye to go out the bay to the farthest inlet. This helped give the painting a feeling of space. The feel of wide open space is a wonderful sense you get in Newfoundland. It is a land that is 98 % unpopulated. I worked on the glazing some more and defined the rocks better. I used glazes of thalo blue , then glazes of burnt sienna, then a glaze of yellow ochre. I repeated this several times with very little paint pigment in the glazes. I kept the area where the boat would be, open, mostly to keep in mind its placement area. 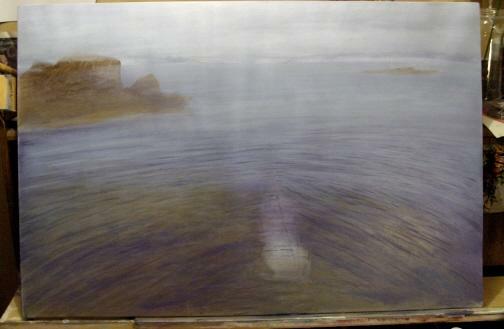 Excuse the blurred photo but the next photo just shows where I sketched a fairly accurate outline of the boat. You have to be very careful at this point. If the drawing is not right on, you could ruin many hours of work . If a line is off by an eighth of an inch it will be noticeable . 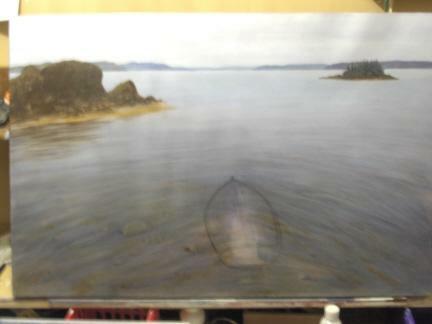 When I was sure the outline was right I blocked in the boat base colors. I wasn’t overly concerned where the green and red was inside the outline as long as I didn’t mess up the outer lines. The green is a mixture of Chromium oxide green and thalo blue. The red is Cad med toned down a bit with thalo blue. I now worked on the rocks at the bottom more . I added a lot more little rocks and added a few more glazes over that. At this point I knew the boat didn’t look like it was sitting right in the water . It could have been an optical illusion because the red and green inside the boat were not where they should be yet. 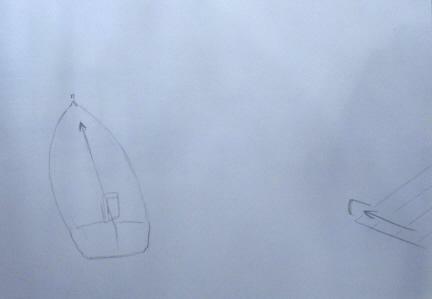 I re-measured my outline and realized it was the bottom line at the back of the boat that was throwing it off. It may sound like I was being too particular. But, to someone who is accustomed to boats and how they sit in the water these things are very noticeable. It was something that was fixable . I also did some more redefining of the rocks at the bottom. I worked on that boat again. 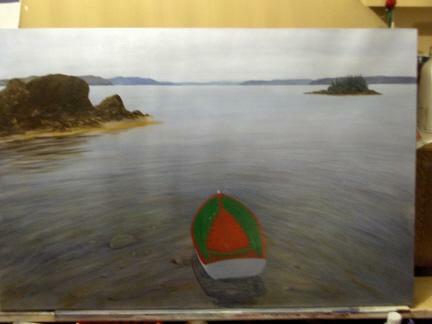 The colors look a little raw at this stage and the boat interior needed more work. I re-worked that shadow; its more of a shadow then a reflection .The sky is overcast so I have to get that fine balance in the details , definition without strong shadows. Easier said then done . Most of the time its easier to have strong light and shadows. I thought I was finished with the water under the boat. The only areas that needed work outside the boat was the island on the left and the indication of a dock on the right side. Next, I put a little more detail into the boat. I changed the rear look of the boat three times . I decided in the end that I was going to make this a simple row boat and not include that 4.5 hp gasoline driven outboard motor. The painting would appeal to me more without that noise making machine. It just don’t fit into my ideal world. The other advantage in not including a gas engine was the fact that one could think of its time period as being anywhere from 1940’s to today. If I didn’t use the bright red and green it could have been dated from 1900 – today. These little wooden boats had the same basic style for a century. These photos aren’t the best quality because they were taken with just the light in the room without a flash. When the painting was done I got a better photo using daylight. I then worked on the island on the left. Its showing low tide and the kelp is visible at the low water level. This kelp in Newfoundland is a distinct orange /ochre/ greenish color depending on the lighting of the day. There as been a shift in my painting technique over the past year or so. I discovered the power of glazing and the excellent properties of Goldens acrylic glazing liquid. I do paint the odd painting with the more opaque method. But,this one will have been done with more layers of glaze then I have ever used before. I have about 20-25 layers in the water. At first I use to try and put glazes on with just glazing liquid and had some difficulty with application . But now I dip my brush in water more and dilute the glaze liquid . This seems to work much better and I don’t get a thick sticky layer that is hard to apply. The secret to successful glazing seems to be in the application of very thin coats,with very little paint pigment in it , and then letting each coat dry before applying another. It is amazing how layer after layer of thin color can produce what opaque paint could never do. I am starting to use glazes more and more as I continue learning about painting. I hope you enjoyed the demo. You can contact me at brrice2003@yahoo.ca . Your comments would be greatly appreciated because feedback lets me know if these demos actually help others in their painting. Wonderful Tutorials, very very helpful, I’ve learned a lot – thank you for sending them. The information about the use of glazes was quite helpful and I also appreciated that you mentioned the colors used. Thanks. Very clear and informational. Thanks for the glazing information. Colors used was also helpful. Thanks. Thanks for the glazing information. Colors used was also helpful. Very informational. I am awestruck bt the beauty of the water! 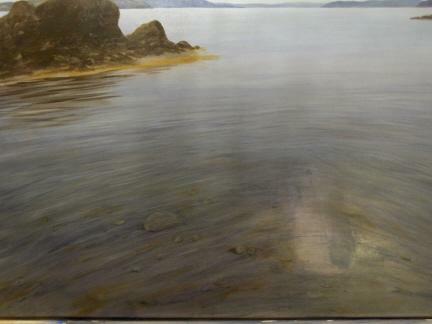 I have never tried glazes but am now determined to do so as I love to paint water in my landscapes. Thankyou for a very clear and useful demonstration and for sharing this beautiful painting. Hi Brian! this picture is stunning and I am so grateful that you were so detailed in your tutorial. I especially appreciated your explanation of glazing. Until you wrote the details, I had so many questions, and then you answered them. Thanks! I hope you keep sharing. I’d be interested in hearing if you lead any workshops at some point. I’m self taught and really like your style and subject. Best of luck to you! Thanks, Brian. It was very helpful. unbelievable,I think this is the photo ! fantastic and perfect art work indeed. Tthanks Brian, your technique is very similar to mine. I’ll have to try the “watering down the glaze method,…perhaps that will add just the right touch to my present arsenal of painting ploys! Thanks for giving us all the benifit of your talents. WOWWW… i thought it was a photo, until i read what u wrote! I don’t paint. Never been able to. Your demo’s are absolutely fascinating. Thank you for sharing the process of a professional. Thank you so much for such a wonderful demo. It is very informative and motivating . Great work!! 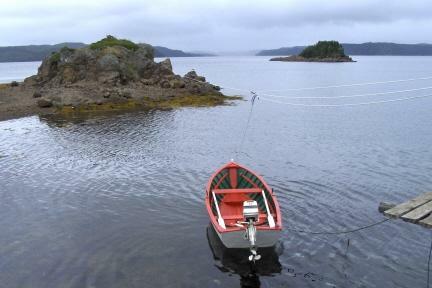 I am fr a little outport in Trintiy Bay NL. I live in Ontario now. Your painting has made me homesick. For me, the painting captured the essence of what NL is. I am trying to paint for the first time. A real newbie. I can only dream about capturing the moment as well as you have done here. WoW! Thank you for stopping by and for your positive feedback! The real credit for this tutorial goes to the artist, Brian Rice. I know he would love to hear from you! Please take a moment to contact him using the email address above at the end of the tutorial. Thanks! Gorgeous painting! I love the overcast sky feel, and the great attention to detail on the islands. The glazing sounds painstaking, but you truly achieved great results. Bravo! I am sooooo impressed, not only with your paintings;also with yoiur keen observation skills and ability to communicate all the details. Totally awesome site, sir!!!! I look forward to seeing you bagain in September as the group rejoins! Bring your “summer” efforts to show! You’ve really put in great effort to this blogpost and the painting! It’s a great visual tutorial. It motivates me to go boating on a lake. Thank you for the detailed explanation and illustrations as you progressed with your artpiece. I just started to explore painting and working with acrylics and you proved that it has great possibilities as a working medium. I look forward to your future tutorials to assist with guidance in application techniques and composition ideas. Excellent, helped me a lot was nearly giving up on acrylics. A beautiful piece Brian, thx so much for sharing your skills with us. You’re an awesome painter. Thank you for explaining your process so clearly. You should write a book with examples like this one. I would buy it! I was 96 last June, mentally and physically able. I am a former Brit national journalist and BBC contracted news broadcaster in the U.K. I paint acrylics and encouraged by my wife Eunice who sadly died from a seizure almost eight years ago here on Salt Spring Island, British Columbia. But this email is not about me. It is about the mind of Mr. Rice and his spiritual recognition of nature in Newfoundland. His aptitude to so expertly ‘bring to life’ the colours in that boat positively speak loud words for his professionalism but far more than that he is a man of peace. during WW2 I was stationed in Cornwall, U.K, similar I have been told as Newfoundland in many respects. Unfortunately I never had the opportunity to discover it. for the distractions under which millions are compelled to live. Excellent painting and gave me as an amateur who has never had a lesson either, great encouragement. almost 25-years ago. Eunice was an excellent artist, but never showed me how. Yours sincerely. And email would be welcome and for the beginners, keep trying because the end product can only be peace.